My hot cocoa from McDonald's. It's hot. Which was good for me, because when it's 5 degrees outside, a girl needs a little hotness in her life. The truth is, I'm not hot at all. I'm cold. Really, really cold. And quite ready for winter to end, thankyouverymuch. Remember how I once wished for a snow day? Well, this past week we had three of them. Yes, you read that right: THREE SNOW DAYS! The first one dumped over 12 inches on us. The second was the worst blizzard the area has seen in a while (the radar on weather.com was impressive, to say the least), and that third snow day was just to clean up after the storm of the second one. The kids were happy enough not to go to school and play Super Mario Brothers all day, and really, I was fine the first day. The second day, though, I totally shut down and did nothing but lie around and read books. And I'll have you know that I did not choose the kind of books to expand the mind or make me think. I read total fluff. Fluff that I enjoy, but lots of fluff. I read the last two installments of Josi Kilpack's Sadie Hoffmiller culinary mysteries. And, hey! I even learned how to say ke aloha o ku'u ola from one of them (Banana Split). It means "the love of my life" in Hawai'ian. I guess instead of trying Google translate last week, I should have just picked up the book that had been waiting for me on my night table. By the third snow day, I wondered why on earth I ever wanted a snow day. Especially since that one will have to be made up at the end of the school year. Which takes place in June. When it is hopefully warm and sunny, although I can't possibly imagine that ever happening again. My house is still recovering. I am still recovering. It's a good thing that The Maestro's spring break is this week (it's a cruel joke to call this "spring" break if you ask me), and I have big plans for us. Things like cleaning up my office, catching up on laundry, and doing other various and sundry tasks around the house. No more reading for me (besides the Sadie Hoffmillers, I read Shannon Hale's latest: Midnight in Austenland and am halfway through Lady Almina and the Real Downton Abbey), because there is work to be done! And practicing! I have two performances coming up and I am shaking in my boots. So I am again picking myself up by the bootstraps that are attached to those shaking boots, trudging through the snow, and accomplishing more than I did last week. A lot more. 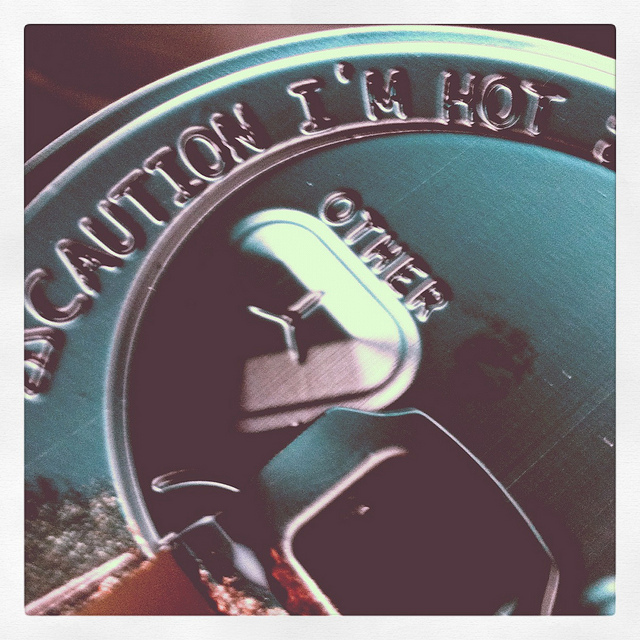 So much more, that I'm totally going to need a warning label that says "Caution: I'm Hot." PS You'll be happy to know that I replaced my phone. I won't have to go through Lent without it after all. I'm going to give up lounging around doing nothing instead, I guess. I found an awesome website called cashforiphones that quoted me a pretty dang good price considering my phone wouldn't even power on. I sent it back to them, and when they receive it, they will email me the official offer and then put it into my PayPal account. We ended up adding another line to our plan, and Bria now has a phone. It was time anyway (she is in middle school after all), and as it turns out, we will be paying less per month. Everything really does work out...and I feel pretty dang blessed for that. Good for you! I'm ready for Summer too! And we have less than an inch in the shady areas of our yard. I don't know how you do it! Snow days are only good for ONE day. What was Mother Nature thinking? And caramel hot chocolate from McDonald's is one of my favorite winter treats. My sister is reading that Real Downton Abbey book and has enjoyed it. We bought our daughter a cell phone last summer (before she started high school) and if we knew how much WE'D love it, we would have given it to her sooner. I am curious to know how the cash for iphone works for you. Stir crazy kids stuck indoors is not fun! Exciting that you have some performances coming up though! We've had a couple of furlough days around here and this is how I felt. The first few? Awesome! The last few? I was chomping at the bit. Fluff reading is such fine reading. It's nice when my brain can kind of vege. I'm so glad the phone worked out! Well, sort of. Glad you'll be getting a new one!